Westbrook Country House is a beautiful 5 star Georgian country home. 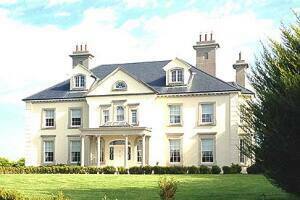 The ideal country house escape, somewhere very special !!! 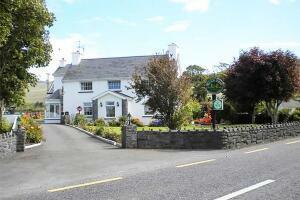 Where warm personal attention and gracious Irish hospitality is instant and natural. 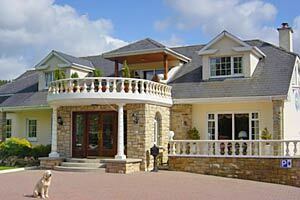 Nestled comfortably within a 10 min drive from the heritage town of Westport and Castlebar. Westbrook sits amidst the most spectacular scenery in Ireland, visitors can explore the untamed beauty of the Wild Atlantic Way, fish, surf, cycle the Great Western Greenway, golf on various championship courses, shoot for grouse, pheasant, duck (in season), visit Westport House and Adventure Park, avail of the guided tours of the National Museum of Country Life, join the climb to Croagh Patrick, gain spiritual reflection at Knock Shrine, indulge in the archaeological trails or just simply relax. Choose one of our 5 star Queen Suits each with superior Jacuzzi baths, hot towel rails, power shower and deep luxurious crested linen and towels. The extensive Breakfast Menu is served and cooked with pride availing of all the local grown products freshly baked breads and scones, and every guest needs and requests observed. Spend the evening in our Library or Drawing Room in front of the open fire or simply unwind in the upstairs Lounge with a game of chess. We provide free WiFi and parking and also accommodate bicycles and surfboards etc. 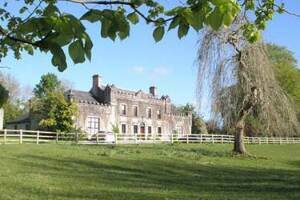 "Westbrook is a hidden treasure, a place where elegance and discretion unfold"
Research your family tree at the centuries old Newpark House - Genealogy library and advice. 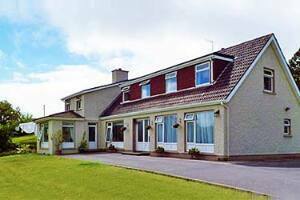 Set in its own parkland close to the Ennis urban area, it offers easy access to Shannon, Bunratty, Cliffs of Moher, Burren and the Aran Islands. Traditional Irish music in Ennis nightly. Woodlands is a friendly family run B&B with private car park opposite Killarney National Park with walkway to town centre through the park. 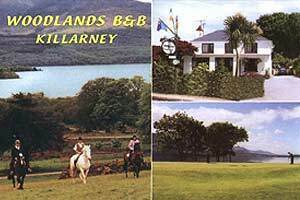 Nearest B&B to Killarney Riding Stables, Killarney Golf & Fishing Club and the Castleross Hotel. 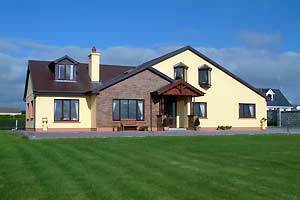 Situated on the start of the main Ring of Kerry and Dingle Routes. A Relaxing sleep and a delicious breakfast is the perfect way to start your day. Woodlands is ideal for those who want to sample the surrounding countryside and enjoy what Killarney's nightlife has to offer from traditional music to great cuisine. Private parking for guests. A sixth generation working farm nestling at the foot of the Slieve Mish Mountains on the Dingle Peninsula. 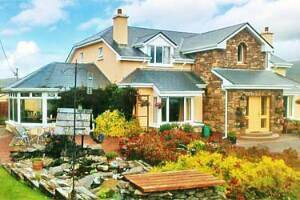 The farmhouse is ideally located on the Wild Atlantic Way for touring the Dingle Peninsula and the Ring of Kerry, as Castlemaine village is the gateway between both areas. This traditional and comfortable farmhouse is renowned for its friendly welcome and excellent cuisine providing an extensive breakfast menu to choose from which will satisfy the most discerning of food lovers. All bedrooms have en suite facilities, king size beds, electric blankets, television and tea & coffee. 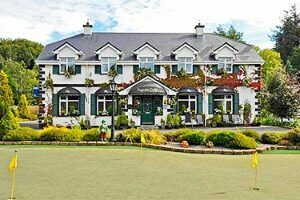 For the golfing enthusiast Murphy's Farmhouse is ideally located as it is within a 30 minute drive from the following world renowned golf courses, Killarney, Ballybunion, Barrow, Dooks and Killorglin. Walking is another activity that the area is proud to offer, Murphy's Farmhouse is perfectly situated for the Kerry Way and the Dingle Way walking routes. Inch beach is 15 minutes drive where surfing is available. 4* Approved Luxury, Spacious well equipped Rooms, free Wifi & Parking. Good food & great Personal Service awaits you. 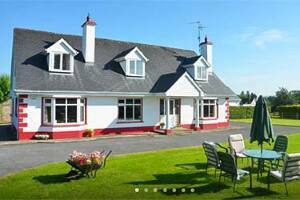 Set in peaceful surroundings on Lough Derg -home of White Tailed Sea Eagles. 2015 awarded Cert of Excellence by Trip Advisor. Lots to see: Holy Island Heritage Site, Mountains, Rivers, Lakes, Birds & Wildlife & to do: Golfing, Bird watching, Fishing, Sailing, Walking, Relaxing too! Our home is 100 year old, Traditional Country House. We are overlooking farmlands. A warm welcome awaits you, with tea or coffee and some homemade cake on arrival. 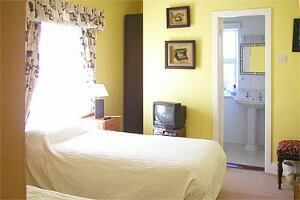 All our rooms are en suite and are spacious, warm and comfortable. At "The Orchard" we have our own farm produce, good home cooking being our speciality. Guests can indulge in our homemade breads, cakes and jams. For Breakfast, Juice, Fruit, Yoghurt and a choice of Cereals are available on the sideboard, so help your self. You may like a traditional Irish breakfast of bacon, sausage and eggs, or perhaps, scrambled eggs with smoked salmon! Or, maybe some cheese and fruit. Homemade bread is always available and you make your own toast when you want it. Tea/coffee making facilities are in the lounge and you may use them any time. You may also raid the cake tin! As Newcastle West is a country town, you will meet mostly locals who are always ready for fun! We have a wide variety of shops and restaurants in the town where guests can sample local produce. Welcome to Augusta Lodge, a modern, purpose built, Irish Tourist Board approved premises which has been recently decorated to the highest standards. We are situated on the Golf Course Road just a short stroll into the town centre of the picturesque heritage town of Westport, County Mayo.